First of all, a disclaimer: These shots of booze and calorie intensive food were taken over a course of a few days and not as one glutton-fest evening. It is just impossible to eat and drink all that food (OK fine it is possible, but just not gastronomically practical). On the great institution that is the London pub, I am a big fan. I am a fan that any bloke can go up to the counter and order a pint with no pretensions. I am a fan that pub workers help you out with a brew that will suit your fancy by making you taste all brews on tap. I am also a fan that you can bring your drink outside and just drink on the sidewalk by the side of the pub. Ales, Lagers, Pilsners, Stouts…. Toast up to London! On a hot day, you can down this without even tasting the alcohol. This needs to make its way to Manila! Maybe time to bring some home. 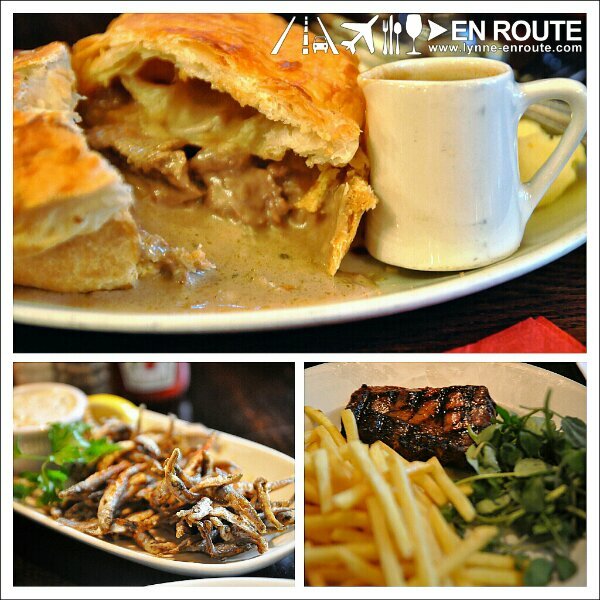 And of course, with pubs, comes pub food. Non-pretentious, comfort inducing meals. If you can, get the meat pies. Shepherds pie is standard, but one great discovery were steak and ale pies. 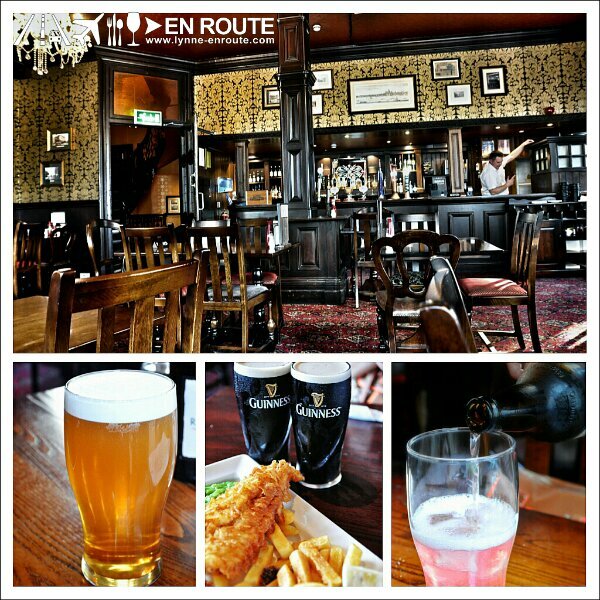 One place to get it is the Blackbird Pub in Earl’s Court. Don’t miss getting the meat pies. It’s worth noting that some pub food might disappoint. There was this rump steak from The Queen’s Arms that the chef botched up by cooking it well done instead of medium, making it dry and rubbery. Glad the sorbet made up for all of it. More pub pics soon! Hopefully no pics of us being thrown out for being too noisy. London’s been very fascinating for me. So much to see and do, like every train station has its own character. Take your touristy Oxford street, the more subdued Covent Garden, and the bustling Earl’s Court as examples. Given the many stops of interest that the boroughs offer, weaving in and out of the crowd amidst this summer heat is enough to parch anyone. As opposed to the coffee culture in France, what the British have are their pubs. Typically found on street corners, they offer the weary traveler a selection of beers to quench the thirst. One time, I tried to see if, by any chance, they had some form of iced coffee. I was told those were reserved for the Starbucks and Costas of London. As a n automatic back-up, I opted for a berry cider to cool me down. And I am now a cider fan. One can easily chug it down without heeding the 4% alcohol volume the pint has to offer. Hmm, not bad. So now, we’re re-arranging luggage to try and fit a few bottles to bring home. They would be perfect for Manila weather. I honestly have no notion what pub food is supposed to be like, as I figured it would be the beers on centerstage. The steak and ale pie from Blackbird in the Earl’s Court area does merit special note though. So for those heading out to London in the future, I think one pub a day should be a nice target. They close maybe around 11pm, as that’s what most liquor licenses allow. And that’s about the time you make a drunken dash for the nearest tube station before they end operations for the day.